For most of the 25 years I've been coaching lawyers, most sought to emphasize their expertise and experience. During the 25-year seller's market for legal services, that wasn't a bad decision. After all, if everyone is buying what you sell, your task is simpler. All you have to do is show that you can do the job and you'll get hired enough times by people who have gotten to know and like you. They're going to hire someone, so why not a pal, especially if the pal's professional pedigree protects the client from repercussions if anything goes wrong. That equation changes radically in a buyer's market, when there's an oversupply of lawyers with expertise and experience. "Gee, I must know 50 excellent Litigators, but we only have work for 30. How will I choose among a surfeit of experts?" Actually, there are roughly 400,000 litigators and 8000 corporate counsel in the US, so the ratio is more like 50:1. In a buyer's market, your expertise and experience becomes the entry fee, not the winning bid. If we segment that to "IP litigators," the ratio will drop by a lot, but the remaining 50,000, or whatever the number turns out to be, are all wearing the same label, which makes them largely indistinguishable and, therefore, interchangeable. They're each good enough. If you have your choice of the same thing from 10 different suppliers, what do you do? You look for a price advantage. At least one of those good-enough will offer a lower price than yours. Undifferentiated offerings are always subject to downward price pressure. Expertise and experience with a type of legal matter only matters when the business problem has been redefined as a legal problem. By then, it's too late to try to get in the game. They've already got more than enough lawyers wearing your label. They have no reason to expand the pool; it's already too big. You may recall that when I introduced this series I put forth some foundation principles for it. One of those was "Litigation, transactions and other legal matters derive from business behavior. They're not self-contained, self-generating entities." If you want to be in the conversation early enough to get noticed by the line-of-business managers who experience a problem firsthand, and first, you have to be relevant to their world. Legal language and labels aren't relevant to people whose conversation is about accomplishing concrete business goals and overcoming the obstacles they encounter. What is relevant is the industry context of their problems. Those who understand that well enough to anticipate issues and extrapolate outcomes are always welcome. You want to be the "airline industry lawyer," not the "product liability lawyer." Everyone in the airline industry -- including corporate counsel -- will talk with people who have something to contribute to the industry conversation. This is even more acutely true for lawyers who seek middle-market or smaller clients. There, you're often dealing directly with principals, or a combination of in-house counsel and one or more principals. If you want to test this relevance argument, at the next networking event you attend, ask someone you meet what they do for a living. They'll probably say that they sell something, make something, fix something, etc. When they ask what you do, answer with legal service nouns and watch their eyes glaze over as they seek a graceful exit. Legal language isn't relevant to most business people. If that's how you talk, you aren't relevant, either, and you won't be welcomed in the conversation. Some years ago I coached a very accomplished M&A lawyer (we'll call him "Bob") who served on a lot of civic boards, charitable organizations, etc., that were populated by a Dream Team of contacts -- C-level executives, civic and academic leaders and so forth. Yet, to his frustration, despite having relatively frequent contact, he wasn't getting any business from them. We went through an exercise that stratifies contacts according to accessibility. Bob had 53 contacts in the highest strata, where people will respond almost immediately. I looked at the list of luminaries and asked him why he thought they had been a dry hole so far. He had been identifying himself as "an M&A lawyer." The problem was immediately obvious. "M&A" is implementation language relevant primarily to counsel, but irrelevant to policy-level executives or leaders. Even though he was absolutely a peer, his self-identification made him not a peer. He was being referred downward to the implementers, all of whom already knew lots of good M&A lawyers. We changed the only thing we could change: what he talked about. He forbade himself to use legal service terminology; that was reserved for his team. I'm grossly oversimplifying, but he embarked on a "lonely at the top" campaign, and began discussing the challenges unique to C-level people. Almost immediately, his A-list began engaging with him more vibrantly and frequently. He was included in the strategic discussions that led to decisions to buy or sell companies, the conversation that precedes the legal M&A discussion. By the time it got to the legal-service level, he had already made himself indispensable. Within about six months, he'd solved the problem and his network was producing robustly. There's an oversupply of legal expertise. 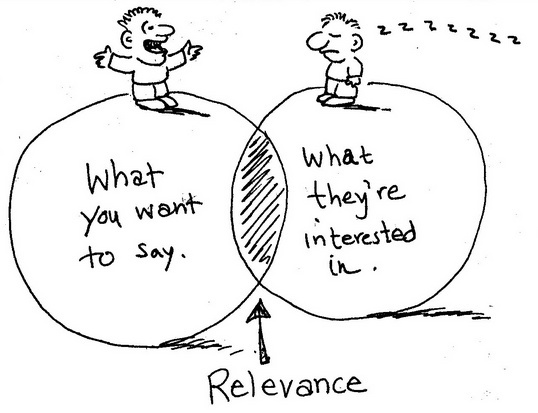 There's always high demand for Relevance, Usefulness, etc. Last week: Not-to-Do #2 - Focus on the Legal Dept.